OOP for 10 Jan 2019 has been released. Other Players still in draw. 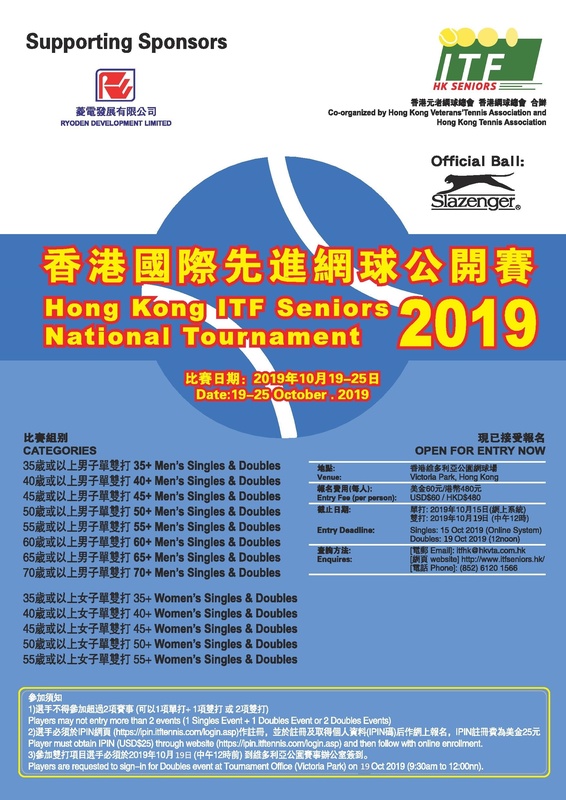 Please contact us at itfhk@hkvta.com.hk to request practice court. Discount price HKD$320 / USD$40 (Original price: HKD$480 / USD$60) for the tournament entry payment will be valid till 4 Jan 2019 1200noon. After that, same as general players. On 6 Jan, 2019, 14:00-18:00 In CRC tournament office . *It is the player’s responsibility to sign in and complete payment. Late payment will be affected you registration , if there are any players whom fee is not paid or is in arrears, he/she will be removed from the draw list. Please contact HKVTA office immediately if you are unable to attend it. For sign-in on 7 Jan, 2019, from 09:30 to 12:00 at CRC office. ©Copyright 2014 The Hong Kong Veterans' Tennis Association Limited all right reserved.